The Recipients section is generally intuitive, but there are a few additional features and tools that offer more possibilities. Please review the functionality described to fully explore the options in the Recipients configuration. 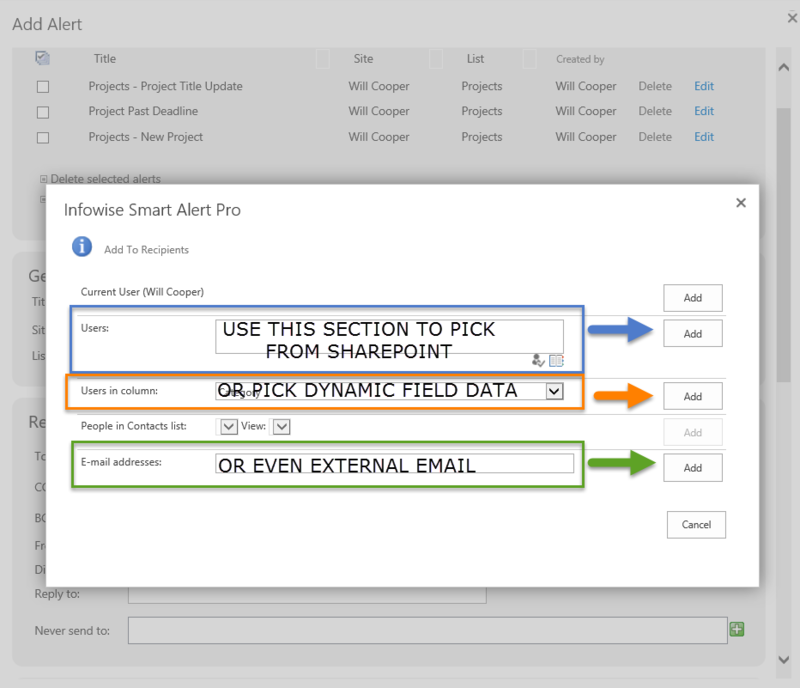 The Title of your alert should contain the name of the relevant list, for example "Projects - Update Alert"
Check to make sure that the correct List is selected. The configuration fields are dynamically adjusted depending on which list is selected. Use the green + icons to open up a people picker dialog. There are a number of possibilities when entering email recipients. SharePoint security groups or people may be selected using a Standard SharePoint People Picker. Users may be selected by using SharePoint People Picker fields. 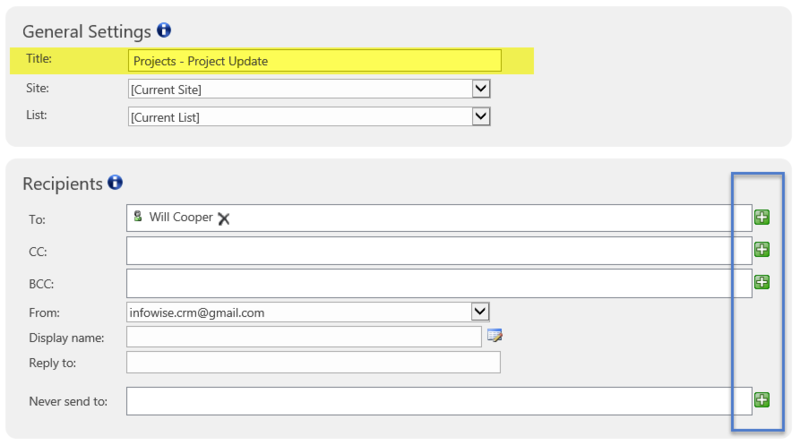 You can use the value from the list in the field "Project Owner" for example. This value will change each time the SharePoint list record is updated to use a different "Project Owner". You may also email users not in SharePoint by entering an explicit email address. If you have a contact list created, this may also be a source for recipients. You may add additional recipients as necessary. The amount of recipients is unlimited. As the developer of your tool, consider adding yourself as BCC on all the email alerts to track that alerts are sent as expected. There is significant flexibility in determining who receives email alerts. It may be tempting to add many people as recipients on emails, but this can cause a negative user experience. Frequent email alerts may be treated as spam by irritated users. Use the column functionality to send email alerts to a record field value that can changes for individual records.